Registration now open for both our Build-A-Bike Summer Camp and Advanced Bike Camp! Please scroll down for more information and to download registration forms. Urban Bike Project summer camps are available to area youth age 11-17 and give campers opportunities to use bikes to explore their communities, participate in community service projects, learn bicycle mechanics, and challenge themselves with exciting outdoor adventures. This camp does not require any advanced knowledge of mechanics or bicycle riding. Campers can be dropped off at 8:30am and picked up at 4:30pm from Urban Bike Project’s shop at 1500 N. Walnut Street each day, except for Friday afternoon. Friday evening, families are invited to join us at Bellevue State Park for an end-of-camp barbecue from 4-6pm. Families who are unable to make the barbecue will be able to pick campers up from the shop at 6:30pm. This option is available for youth who have some prior experience with bicycle mechanics and riding longer distances. This camp is perfect for those who have already participated in Build-A-Bike Summer Camp, who regularly attend Youth Shop, or who have a particular interest in biking and/or mechanics. Campers will try their hand at advanced mechanics challenges (such as building a wheel from scratch), continue to explore the connection between volunteerism and healthy communities, and experiment with different styles of riding such as bmx and bike touring. The week is topped off with an overnight bike ride to Lums Pond State Park! On Thursday, campers will ride 23 miles on trails and low-traffic roads, and spend the night in yurts at the park campground. In the morning, we’ll explore some of the adventures offered in the park and then ride a van back to Wilmington. This route is flat, and there will be plenty of adult chaperones and a support vehicle to ensure everyone’s safety. However, please be advised that campers will be riding on roads for part of the route. This camp is not recommended for youth who have not mastered basic bike handling skills, or have never ridden at least 5 miles at a time. All necessary equipment (sleeping bag, bike, etc.) is provided to campers who do not have their own. Campers can be dropped off at 8:30am and picked up at 4:30pm from our shop at 1500 N. Walnut Street every day except for Thursday afternoon and Friday, due to the overnight field trip. Families are invited to join us for an end-of-camp barbecue on Friday from 4-6pm. Families who are unable to make the barbecue will be able to pick their campers up from the shop at 6:30pm. $125/week includes: lunch and snack each day, activity fees, materials, end-of-camp barbecue for campers and their families. Build-A-Bike Camp also includes a refurbished bicycle. Advanced Bike Camp also includes dinner Thursday night and breakfast Friday morning. If your child participates in our Youth Shop program on Wednesday nights, they may attend camp for only $10 for the whole week. Your child may choose to use their shop credit to pay for camp. You do not need to fill out the scholarship application if your child participates in our Youth Shop program. We offer a “pay what you can” option for families who are unable to cover the $125 fee. This option allows you to decide how much you can afford to pay for camp and include that amount with your registration forms. The minimum fee is $10. To take advantage of this offer, you must fill out the one page scholarship application. Please keep in mind that your child will receive daily meals and lots of enriching experiences. 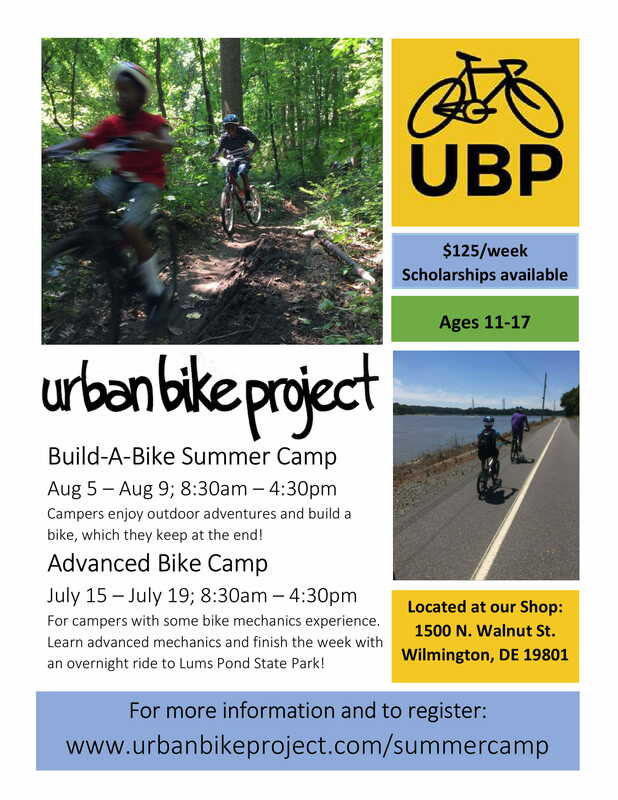 Urban Bike Project staff and volunteers work hard to make this opportunity available for all Wilmington area youth. Please pay what you feel is fair.